Subtractive manufacturing or subtractive fabrication involves cutting away from a solid block of material. It could be a block of, for example, metal, plastic, or wood. 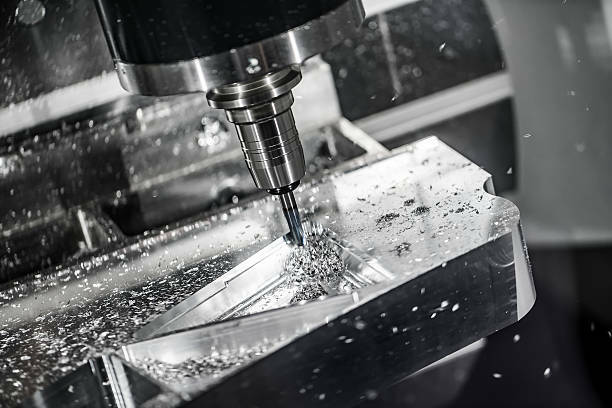 A milling machine cutting/hollowing out a piece of metal or plastic is an example of subtractive manufacturing. Subtractive manufacturing by manually cutting the material is also possible. In fact, before the industrial revolution, that was how most of it was done. It contrasts with additive manufacturing. The adjective ‘subtractive’ means ‘tending to or able to remove or subtract.’ If something is subtractive, it takes things away. The adjective ‘additive,’ on the other hand, means ‘tending to or able to add.’ If something is additive, it means that it adds things on. Additive manufacturing means creating three-dimensional objects by adding layer after layer. Since the turn of the century, additive manufacturing technology has advanced significantly. 3D printers today can even create jet engine turbines. Subtractive manufacturing or ‘machining‘ involves cutting, hollowing, or taking parts out of a block of something. Sculptors go through this process when they make statues. They start with a big block of stone or wood and gradually chisel away at it. Eventually, they have a statue of a man, woman, child, head, animal, etc. Put simply; additive manufacturing involves adding layer (or bits) after layer (or bits). Subtractive manufacturing, on the other hand, involves taking away layer (or bits) after layer (or bits). In manufacturing: with ‘subtractive,’ the object gets smaller as you progress. With ‘additive,’ it is the other way round – the object gets bigger as you progress. A person who operates machines in the subtractive manufacturing process is a machinist. Machinists work in a machine shop. Subtractive manufacturing or machining is part of the manufacture of most metal products. Gradually, CNC is replacing the human machinist. CNC stands for computer numerical control, in which a computer controls the movement and operation of subtracting machines such as lathes and mills. However, milling undercuts are not always easy. Machining also tends to be more expensive than using an additive process.